8 1/2 x 10 1/4 in. Ed Ruscha can be called the Jack Kerouac of art. Since his first road trip from Oklahoma City to Los Angeles in 1956, West coast Pop artist Ed Ruscha has been influenced by themes and icons surrounding America. The drive, which he took with his life long friend, classical guitarist and composer Mason Williams took about three days in a 1950 Ford sedan. At the time, Ruscha, who has since become an avid photographer, did not own a camera and the only record of the trip is a log that the artist has kept over the years. The two friends, who were still teenagers at the time, used the log to keep track of their expenses as they were trying to stick to a budget. The log tells the story of their journey. Ruscha has said: “My art, really my life, evolved out of that trip. […] The log took the place of photographs. I got a camera soon after arriving in L.A.” American landscapes and text are what the artist is best known for, both of which emerged from from his cross country experience. This week’s Work of the Week! WOW! 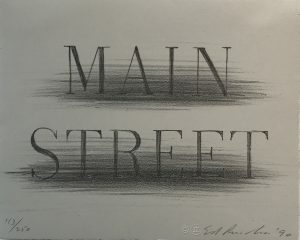 is Main Street, by Ed Ruscha. “Main Street” is part of the iconography of American life. The “Main Street of America” branding was used to promote U.S. Route 66 in its heyday. Main Street is a generic phrase used to denote a primary retail street of a village, town or small city. In small towns across the United States, Main Street is not only the major road running through town but the site of all street life, a place where townspeople hang out and watch the annual parades go by. In the general sense, the term “Main Street” refers to a place of traditional values. However, in the America of later decades, “Main Street” represents the interests of everyday people and small business owners, in contrast with “Wall Street”, symbolizing the interests of large national corporations. Ruscha treats words as visual compositions which are typically categorized between pop and conceptual art. Works feature a word with strong connotations and a powerful visual impact. Ruscha uses the multiplicity of meaning to encourage the viewer to consider all the subconscious connotations of the word. This could be expanded to an exploration of the subconscious meanings hidden in all forms of language. The words elicits a mixed response within the viewer in which preconceived ideas about the subject are confronted and either validated or challenged. Noting the transformation of Main Streets in American cities from small “mom and pop” businesses, ice cream parlours, and public square gatherings, to big box stores, chain restaurants, and consumers jay walking across the street, while burying their heads in their cell phones, the words Main Street takes on a much diff erent meaning than it once did. Ruscha’s Main Street, not only takes us back to the days of nostalgia, but also to modern times where Main Street meets and flirts with Wall Street. Innocence and American values are overshadowed by greed and technology. Overshadowed is the key word, because not only is Ruscha’s Main Street a sign of modernism replacing the past, but it also implies a sense of hope, that one day the traces of the past will lead to a happy memory, and a wanting to inject the future with the values of the days of old. Rather than simply painting a word, Ruscha considered the particular font that might add an elevated emotion to the meaning much like the way a poet considers a phrase. By painting a word as a visual, he felt he was marking it as offi cial, glorifying it as an object rather than a mere piece of text. The typography of the words in Main Street sets this piece apart from the majority of his work because it is not done in “Boy Scout Utility Modern.” Inspired by the Hollywood sign, the artist invented “Boy Scout Utility Modern” in 1980, and uses it regularly in his works. In this case, rather, the font seems closer in nature to “Times.” “Times” is a classic font, designed for its legibility so it is an obvious choice for a representation of the most famous street name in America: Main Street. Main Street is an ode and textual portrait of an American symbol. This entry was posted in WOW! and tagged americanart, art, artgallery, contemporaryart, edruscha, fineart, gallery, greggshienbaum, greggshienbaumfineart, gsfineart, gsfineartmiami, MainStreet, miami, miamibeach, modernart, mustsee, pop, popart, prints, ruscha, workoftheweek, WOW, WOW!, wynwood, wynwoodmiami by admin. Bookmark the permalink.